Our kickboxing program incorporates elements of American Kickboxing, Muay Thai, and Boxing taught by experienced instructors that are passionate about the arts. All kickboxing students – at every level, learn and focus on the basics of striking, blocking, and countering. We always work to strengthen the basics. The beginner kickboxing program is where you’ll learn how to properly throw punches and kicks and how to use your core and hips to generate the inertia necessary to create power. You’ll learn the basics of defensive fighting, including how to block and parry punches, check leg kicks, and how to counter strike after a block. The beginner kickboxing class starts with a 10-minute warmup including running, calisthenics, and stretching to get your body ready for the workout ahead. We then move to kicking drills where you’ll learn to throw a proper Muay Thai kick, using your hips to generate power. You’ll also learn how to hold Thai pads properly. You’ll work with a partner for this drill. The second part of the beginner kickboxing class includes punching and kicking combination drills. An instructor will demonstrate 2-3 combinations which you then drill with a partner using boxing gloves and Thai pads. We end the beginner kickboxing class with 3 rounds of conditioning exercises using a heavy bag., throwing the kick/punch combinations learned in class. We toss in a few 15-second “speed rounds” where you’ll punch and kick as hard and as fast as you can to expend as much energy as possible to burn fat and tone muscle. 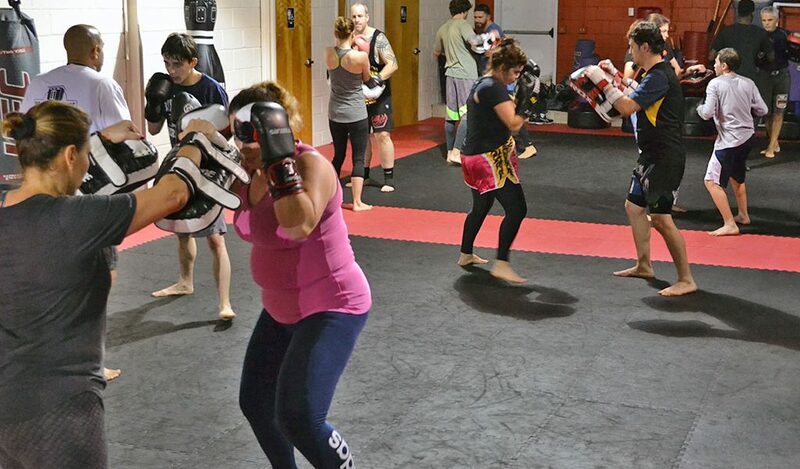 The beginner kickboxing class is a lot of fun and an incredible workout. And, you will learn authentic kickboxing skills that will last a lifetime. If you ever wanted to try kickboxing, now’s the time. Just sign up for a free trial class and experience the fun and exciting sport of kickboxing. Get started now!